At long last Karen Jobes’s Discovering the Septuagint: A Guided Reader, has been published by Kregel Academic. The TL;DR version of my review is: while the resource has a few noticeable flaws (easily fixable for a second edition), its addition to the world of Greek reading and Septuagint studies is long overdue. Below is a longer review of the book, in what I hope will be easy-to-scan Q & A format. Jobes says it “contains everything needed for any reader with three semesters of koine Greek to succeed in expanding their horizons to the Septuagint” (8). I think this assessment is right, as I found the book easy to understand (though I’ve had more than three semesters of Greek). Each LXX book has a short introduction. Then there is the passage, verse by verse, with the Greek text re-printed in full. Under each verse are word-by-word and phrase-by-phrase comments on the vocabulary, usage, syntax, translation from Hebrew (the book is strong here), and so on. Following each passage is the NETS (English translation). The end of the book has a three-page, 33-term glossary and a two-page “Index of New Testament LXX Citations” for the books included in the reader. It shouldn’t go without saying that the very existence of this resource is a boon to Greek readers. 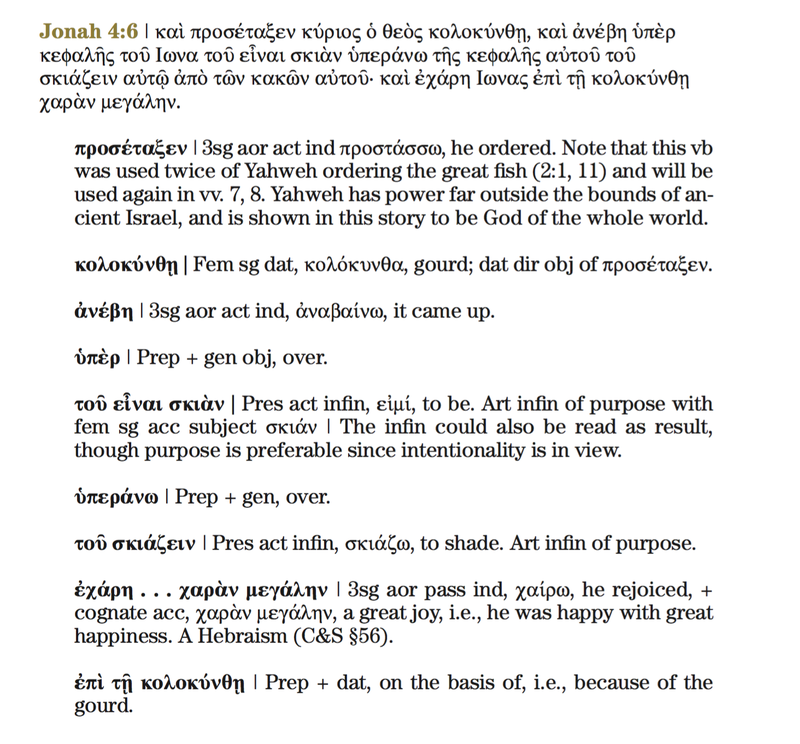 There is Conybeare and Stock, as well as some passages in Decker’s Koine Greek Reader, but readers of the Septuagint have far fewer resources than readers of the Greek New Testament. The margins are plenty wide for students to jot down their own parsings, translations, and notes. ἀνὰ μέσον . . . ἀνὰ μέσον | Idiomatic prep phrase, “between.” This is a Hebraism, so there is no need to translate the second of the pair as NETS does. Whether or not a fourth semester Greek student should remember that nominative and accusative forms are identical in the third declension is another issue. That the reader reminds me as much is welcomed. The glued binding doesn’t do justice to a book like this, but that seems to be the way many publishers have gone recently, even with reference works in biblical studies. Introductory issues are quite sparse–whether in the introduction to the Greek of the Septuagint itself (just two pages) or in the introductions to books. I would have liked it if the contributing writers had offered more for each book–even three or four pages would have gone further than the one or two that are here. This last point deserves just a couple more lines. A number of the introductions adapt or “abstract” their text from the NETS book introductions, which readers could easily enough have found on their own. In some ways the book introductions read just like exam study guides you might have made yourself for a grad-level class on the Septuagint. That may be, in fact, how they started! (Jobes is chief overseer of the book, with many contributors.) This does not make the introductions not valuable, but it will probably leave readers wishing for more detail. All in all, Discovering the Septuagint is worth owning. The number of times I’ve gotten grammatical or morphological help from the comments far outweighs any of the volume’s weaknesses. And there is a lot of Greek help to be had here. I’ll be making repeated use of this book by Jobes and company, and am glad it’s finally on the market. Discovering the Septuagint is available from Amazon, as well as from Kregel. Thanks to Kregel for sending the review copy, provided to me so I could write about the book, but with no expectation as to the content of my review.